CHAIRMAN'S REPORT GREG FORCE, PCI details. "We are completed with the tracking, and the data is being compiled, making cer- tain we've done a parametric analysis to quantify the sensitivity to various design pa- rameters. We anticipate that by the end of the year, we'll have the full report ready for review by PCI's Technical Activities Council." LEVERAGING THE BRAINTRUST Having spent a great deal of time on vari- ous committees throughout his time with PCI—Parking Deck, Chair; Justice Facilities, Chair; Technical Activities, member; 7th Edition of PCI Handbook, Chair—Force is well acquainted with the technical side of the business, but as he recalls, things are always moving forward and changing. "I want to continue to leverage that. It never ceases to amaze me the body of knowledge and true experts we have in the field that are collaborating to work on these various committees to produce these technical publications," he says. "It's important that people are using that knowledge in terms of making sure these things are translating into influences for construction through codes, as well as practical applications. "There's more engagement to be gained by having more producer members involved to see these things and spark these ideas and push these new ideas forward. I think we'll see more efforts going forward, in terms of looking for the larger-type proj- ects. Some of these projects move so fast and are so big that you may see multiple companies tag-team to get them done. It allows us to distance ourselves from other types of construction by showing that we can put a building in place faster than any other type of construction, as well as its being well designed. "The other thing we need to continue pushing is the reliability and viability of our certification programs. We've had the plant certification program in place for 45 years, and a couple of Tindall plants were recog- nized for having been participants since the program's inception, as did others. We're also waiting to bring that focus to the field; we have very competent erectors out there, but we also need to have that level of in- spection that augments and assists the spe- cial inspections the code calls for. We've almost completed special inspection train- ing for third-party inspectors for the field installation of precast concrete." PROJECT UPDATES PCI's continuing education program contin- ues to see an increased number of atten- WWW.CONCRETEPRODUCTS.COM APRIL 2012 | 31 dees to such events as monthly webinars, including the recent "Perspective Gained from the Earthquakes of Japan, Chile and New Zealand," which drew more than 400 participants, according to Force. 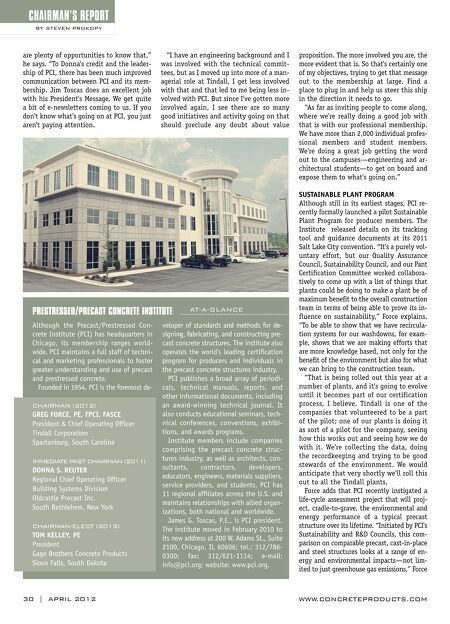 "It was fascinating what the team brought back from a technical standpoint, such as what they learned about the response of precast structures, the discreet points of load transfer, and how total structures per- formed overall. They also observed some in- novative designs as well as buildings that had been up for some time that held up quite well," he says. "To see that much solid evidence of resilience of this type of construction really speaks well of precast. We talked about the viability of total pre- cast buildings; this is great supporting ev- idence as to the merits. "It goes to our long-term strengths of leveraging our technical brain trust, we can continue to build on what we already know. That was the point of sending these teams to these three places. We could have sat back and said, 'We'll wait and see what we hear,' but we wanted to be more active. And the people in all three countries were ex- tremely accommodating and collaborative with us. There are a lot of positives to come out of that, and it helps us build on our body of knowledge." The second edition of the Seismic Design Manual was released in conjunction with the Structural Engineering Institute Con- gress in Chicago at the end of March; it should be available electronically and, in limited quantities, hardcover format. "The design parameters, requirements and body of knowledge as far as the characteristics of structures is always changing and pro- gressing, so it's about keeping current," Force says. "By the time the third edition of the Seismic Manual comes out, those les- sons learned from those three events will be reflected in those pages." In addition, the delayed publication of PCI's new hollow core manual will happen by the end of the year. The manual was drafted entirely by volunteers with no paid consultants. When last we spoke to a PCI chairman, some areas of the country were adopting new bridge girder profiles in an effort to save money on certain projects, a trend that PCI was tracking closely. "The reaction to these new girders has been very good," Force declares. "People that are producing bridges are proactive in trying to push the envelope. 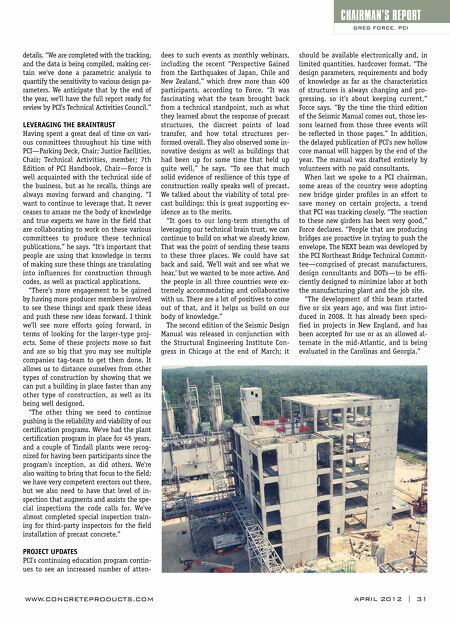 The NEXT beam was developed by the PCI Northeast Bridge Technical Commit- tee—comprised of precast manufacturers, design consultants and DOTs—to be effi- ciently designed to minimize labor at both the manufacturing plant and the job site. "The development of this beam started five or six years ago, and was first intro- duced in 2008. It has already been speci- fied in projects in New England, and has been accepted for use or as an allowed al- ternate in the mid-Atlantic, and is being evaluated in the Carolinas and Georgia."